Leonid Larionov – Norges nye stjerne-bass	Sheena Easton – The great Scot! Vikki Carr – One Hell of a Singer! Almost a year ago, I did announce a closer look at the great Miss Vikki Carr and her many albums, thereby dipping into the musical legacy of a great singer who is maybe one of the most versatile artists around. 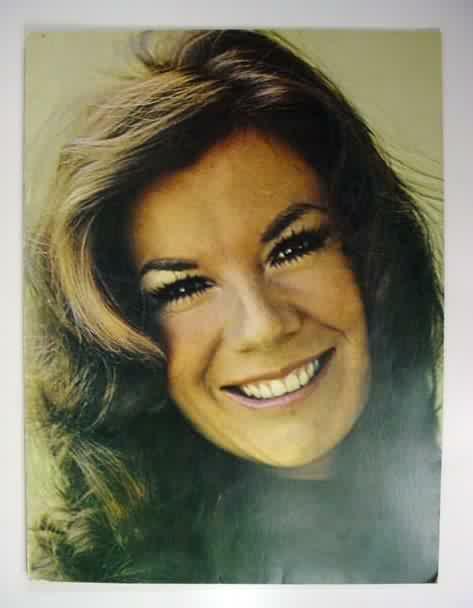 To categorize Vikki is close to impossible, but we can roughly divide her career into three different phases: For most of the 60’s she was a pop singer of the traditional kind, for the first part of the 70’s she was a combination of country singer and modern pop singer. And then finally from the mid 1970s and up until today, she claimed her position as the all-round Queen of latin pop. So the 40+ albums she has released since the first one came out in 1963 stands as a unparalelled documentation of how one of the greatest voices in the music business took on different shadings through the years, adapting to current trends, shaping her voice to fit any kind of material – and losing none of her spark and personality through it all. Born in El Paso, Texas in 1941, Vikki was given the fabulous birth name Florencia Bisenta de Casillas Martinez Cardona. She grew up with her 6 brothers and sisters in Southern California. At the age of 20 she was signed to Liberty Records, making her debut single in 1962. Called “He’s A Rebel” – it was a small hit in Australia. In the US Darlene Love recorded it, and as released under The Crystals name, the song soared to number 1 on the charts – and Vikki’s version went nowhere…! Pity, because the two versions are quite similar, and equally well performed. Oh, well – Vikki quickly made a version for the Spanish-speaking market (“Es Rebelde”), and then started preparing her first album, “Color Her Great” (1963). While her first single suggested a pop singer very much steeped in the then-current trends, her first album showed that Vikki chose another direction; she picked most of the material from the classic American songbooks and traditional pop. But by doing that, she carved out her own niche – here was a young, fresh talent doing material from way back, thus combining her youthful appeal with something the older generation also could relate to. Also evident from the opening track was the fact that vocally, Vikki’s voice was far better suited to a little more demanding stuff than what most of the early 60s girl-group pop floss could offer. She opens the album with a zippy version of the old chestnut “Bye Bye Blackbird”, adding to it a professional touch and style that makes it seem like she had spent 20 years in the business already! The next year she put out two albums, much in the same style as her debut, called “Discovery” and “Discovery II“. The opening track of the first one, is the very first song I heard Vikki sing, and that one that turned me into an instant fan! From the musical Oklahoma, “The Surrey With The Fringe On Top” had been performed for years – but never like this! Vikki starts out sweetly and gently, obviously having a great time acting out the farm girl. Then for the third verse she suddenly adds power, making you jump to attention – then the does the ending in an intimate whisper. It is a great example on “how to do it”; if you choose to sing the standards, you need to add something new and fresh to make your version stand out. That is one thing Vikki Carr did right from the start, and so she made even the most time-worn old songs sound as they were written and tailor-made just for her! She stuck to the same musical formula on her next album, “Anatomy Of Love” (1965), but (as the title might suggest) did a lot more current stuff on “The Way Of Today” (1966) – i.e. doing covers of recent hits like “You Don’t Have To Say You Love Me” and “Anyone Who Had A Heart”, “I Will Wait For You” and “Strangers In The Night”. 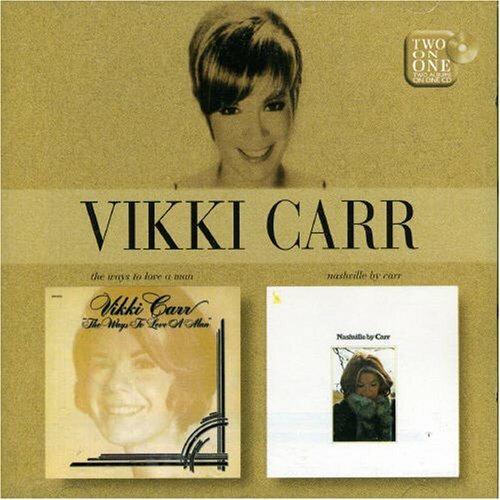 If there is one song that will forever and always be connected to Vikki Carr, it’ “It Must Be Him”. It is still her greatest hit, and a song that gave her no less than three Grammy nominations. The single soared almost to the top of the charts, and the album “It Must Be Him” (1967) was a huge hit as well. In addition to its classic title track, this album is also the home of some incredibly good songs like “A Bit Of Love”, “Never My Love” and the completely stunning “Tunesmith” (recorded, equally well, the same year by Johnny Rivers). Riding high on the crest of this hit record, Vikki made three more albums during the late 1960s, the last one being the live “For Once In My Life” – showing that she also had a great connection with her audience! Enter the 1970s – and Vikki changed directions once again – this time to country & western. Both her first two albums of the decade had a very strong Nashville feel to them, and (not surprisingly) proved that she was very good doing this kind of music also. First off came “Nashville By Carr” (1970), followed by “The Ways To Love A Man” (1971). “Nashville By Carr” is maybe a bit more “country” than its successor. Vikki does a variety of early 70s country songs here, the stand-outs are “Singing My Song”, “The Tip Of My Fingers” and “Sunday Mornin’ Comin’ Down” – very convincingly performed from the female point of view also! “The Ways To Love A Man” is a little more subdued as Vikki goes in for a very relaxed and ballad heavy style on most tracks, along the way making even Bobby Goldsboro’s saccharine “Honey” sound good! The early 70s was a very productive period for Vikki, before 1973 was through – she had made four more albums. The next two are good examples of the kind of luxurious pop music made back then; “Love Story” and “Superstar” (both 1972). Both albums finds the wondrous Vikki backed by sumptuous orchestrations and strings – making them some of the best “adult pop” albums recorded. On the first one, she does great songs like Gordon Lightfoot’s “If You Could Read My Mind”, “If I Were Your Woman” (a then-recent hit for Gladys Knight & The Pips, later done by Bonnie Bramlett, Stephanie Mills and others), a stunning take on Diana Ross’ “Ain’t No Mountain High Enough” and “For All We Know” (a song also done by The Carpenters, Shirley Bassey and Norma Lewis). “Superstar” contains the great title track (written by Bonnie Bramlett and recorded by her twice). It was a hit also for The Carpenters as well as Bette Midler the same year. Other highlights include “I Can’t Give Back The Love I Feel For You”, “The Night They Drove Old Dixie Down” and “Loving Him Was Easier”. This album is also proof of Vikki’s great skills as a singer and interpreter; she waxes soulful on “Spanish Harlem”, plaintively heartfelt on “Crazy Love” and sensuously filled with longing on the title song…. Then it was time to change musical directions once again, and her next album was done all in Spanish; “Vikki En Espanol” (1972). Though she had done some Spanish material earlier, this album is the first time she comes off as a true latin styled singer. The Carr voice is very much the same, but she adds another flavour to it, making all the songs sound like the “real thing” and not like any American singer, just singing in another language. The best example is “Se Acabo” – a fiery chestnut that was also recorded with various degrees of “latin fuego” by Lola Flores (ay! ), La Lupe (explosive!) and even Eartha Kitt (smouldering!). Putting all her Mexican heritage into the music on this album, it is a true achievement and is the first step Vikki took into establishing herself as a major star in the Spanish-speaking music market! 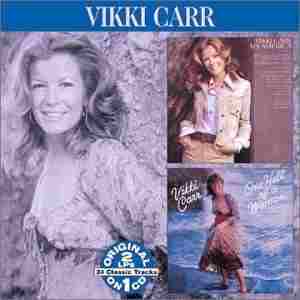 During 1973 and 1974, Vikki put out the last two of her “American pop” albums; “Ms. America” (1973) and “One Hell Of A Woman” (1974). Both of them finds Vikki squarely placed within the middle-of-the-road, adult contemporary bracket, and she comes off a little like a female John Denver or James Taylor. Both albums are very pleasant listening, filled with great songs – but I also feel that she has fazed out some her of vocal trademarks on these albums – some of the old spark isn’t really there, and on the first listen, it could be anybody singing these songs… You don’t recognize anything very Vikki here. But this doesn’t mean the albums should be avoided, by all means – this is very good stuff indeed! From the 1975 album “Hoy” and onwards, Vikki made almost exclusively Spanish language records, and thus starting another direction of her career. Since then she has churned out one great latin album after another, a complete list can be found on her great website www.vikkicarr.com. In doing so, there was a downside to it as well; By American and international listeners, she is today considered a “60s singer”, someone who “used to make records” and thought of as someone who appears on the oldies circuit, doing her hits from way back when…. It is very far from the truth of course – but an indirect result of limiting herself to the Spanish-speaking market. But her triumphs as a singer has been much appreciated by her new audience: she received gold and platinum records for her hits “Total”, “Disculpame”, and “Mala Suerte”. Her 1985 mariachi album “Simplemente Mujer” earned her a Grammy Award, her 1992 album “Cosas Del Amor” did the same. Vikki has also received a lot of other distinctions, awards, keys to different cities, an honorary award from the Vietnam veterans, and she has sung for no less than five different American presidents! 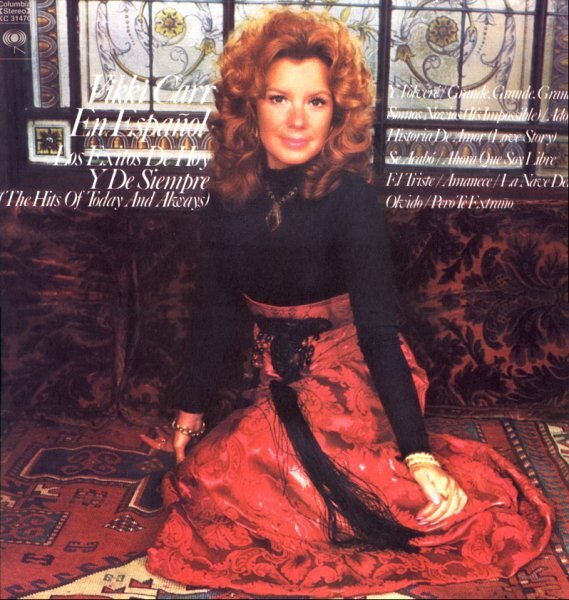 When looking for Vikki Carr albums, you will find that any and all of her latin albums are widely available, but that a lot of the albums she made 1963-75 might be hard to find – and if you do, they are quite expensive. EMI put together a 3 CD set in 2007, containing 80 songs – taken from her 60’s albums as well as some foreign language versions and some single sides – called “The Ultimate Collection“. This is highly recommended as it gives a great musical portrait of one of the best singers who came on the scene during the 1960’s. The wonderful Vikki Box Set – treat yourself to this one! One of her albums may be called “One Hell Of A Woman“, but a more fitting title might be “one hell of a singer“. In a career that has lasted more than 50 years, Vikki Carr has just about done it all, she has done it incredibly well, she has made a career in two different musical universes – and is just as much respected as a “latin” singer as she is an “American” one. The quality of her recorded output (in any language) is totally awesome. She belongs with the best of the female singers of the 1960s, in the same class as Barbra Streisand, Connie Francis and Liza Minnelli. But then again, the second phase of her career might place her as the female counterpoint to Julio Iglesias as well…. No matter what language or style – Vikki Carr is one great singer – always! Punto y final!